I keep hearing about Higher Frame Rates (HFR) in theaters? What exactly is it? Frame rates are based on the number of images (or frames) displayed by a projector in one second. The current standard in cinema is 24 frames per second (FPS), which it has been since the 1920s. Now, however, many of the top Hollywood filmmakers such as James Cameron and Peter Jackson are calling for frame rate standards to be increased to 48, and even 60 FPS. They have demonstrated that higher frame rates contribute to less flicker, motion blur and stuttered movement on the screen, resulting in a much smoother viewing experience. Higher frame rates have been proven to be especially beneficial for viewing 3D movies. In 24 FPS 3D action sequences, the fast-moving 3D images appear to break apart, making audience members struggle to focus on the images. It’s this “image break-up” that causes some viewers to feel ill or uncomfortable watching 3D movies. However, with HFR 3D movies, this is no longer an issue. HFR filming supports a wider range of camera moves, creating an ultra-realistic movie-going experience that is easier to watch. With the advent of digital cinema, the movie industry is finally able to affordably shift away from production and playback techniques that date back almost a century, to new HFR and 3D HFR technology that delivers much more lifelike visuals. Who are the leading players in the research and development of HFR? In Hollywood, movie veterans like Peter Jackson and James Cameron are forging the path for shooting feature films at the higher frame rate. Jackson’s “The Hobbit” has already been filmed at 48 FPS and Cameron’s “Avatar” sequels are set to be shot at 60 FPS. In exchange, Lightstorm is sharing with Christie its findings into 3D, high frame rates and the enhancements, format, and color space requirements for achieving the optimal viewing experience. The results of this collaboration has already begun to enhances our 3D technology as it relates to desirable projector and server functionality, as well as helping Christie create market-leading tool kits for exhibition and post-production markets and applications. 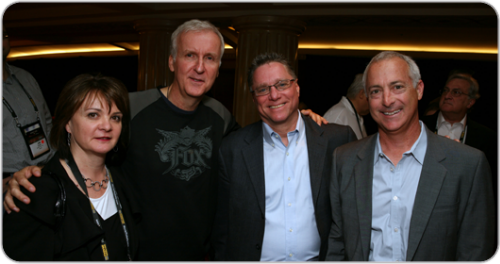 George Scheckel, Christie Director of Business Development; Craig Sholder, Christie Vice President of Entertainment Solutions. What is Christie doing to prepare the industry for HFR? With the technology still very new and evolving, exhibitors are confused by what they’ll need to do and what it might cost. 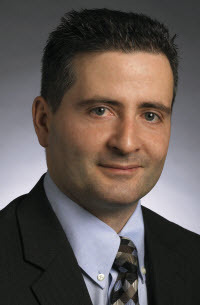 They are concerned that, while HFR doesn’t represent a wholesale technology shift, like the conversion from analog to digital, it could lead to budget implications. Fortunately, in addition to feature movies, exhibitors will reap the benefits of emerging revenue opportunities in alternative content screenings, such as performances by the New York City Opera, that will be enhanced by HFR. Since high frame rates will also have a profound effect on the ability to capture and display sporting events, Broadway productions and dance, the opportunities are endless. How soon can we expect HFR to appear in theaters? The first installment of Jackson’s “The Hobbit” is targeted for release in December 2012, making it the first feature film to be shot and screened in 48 FPS. It is expected that more than 10,000 screens will be capable of projecting the movie at the higher frame rate by its release date. With Cameron’s “Avatar” sequels set to hit theaters in 2014 and 2015, other HFR film projects will undoubtedly follow. What kinds of modifications/new technology will today's digital cinema projectors need to play HFR? Historically, the storage and media block have been separate components from the projector, housed in a device commonly referred to as a server. Connecting the server to the projector is a dual HD-SDI cable link that moves the video data. However, the sheer volume of uncompressed video data that needs to be moved has always caused a bottleneck or compromises in quality. One of the biggest impacts of this bottleneck is to today’s 3D 24 FPS/eye content, because it forces about half of the color information to be discarded to allow the video data to move across this interface. Christie is addressing this bottleneck through the introduction of an Integrated Media Block (IMB) architecture that puts the media block physically inside the projector. This system allows HFR content to pass directly to the projector, completely uncompromised, and using all the available color information for the movie. The result is a higher quality image that is closer than ever to the filmmaker’s original vision. What products will Christie offer to ensure the highest quality HFR? To begin taking full advantage of the HFR evolution, Christie offers exhibitors a simple two-step solution. It has developed software that makes any existing or new Series 2 Christie cinema projector ready for HFR alternative content. This software, the Christie Solaria™ 2.2, is a firmware upgrade that requires zero down-time to make the changes, with local technical partners being able to handle the upgrade. Theater operators can also download this new software to a USB drive and follow a few simple steps to make the changes themselves. That firmware upgrade enables the projector to accept video content at higher frame rates than traditional cinema content, and passes it through the video pipeline of the projector, while maintaining or enhancing the visuals that hit the big screen. It will handle both cinema and alternative content at 48 and 60 FPS/eye. The software will also be a new tool in the highly complex and highly collaborative post-production process for 2D and 3D HFR films. Since exhibitors must also choose an HFR capable Integrated Media Block (IMB), Christie developed a one that fits into all of the Solaria Series 2 projectors already on the market. It’s an electronics board that sits in a spare slot in the projector. A technical partner or theater operator can easily pop open a blank faceplate and snap the module into place. It’s designed to work seamlessly with the projector’s HFR software to provide an uncompromised image. In addition to removing the need for the HD-SDI cable link, the IMB increases data security by doing the decrypting work inside the projector, away from any external connector that could invite tampering. What new developments does Christie see in digital cinema for the near future? And while HFR is currently revolutionizing the movie-viewing experience, there’s much more exciting technology on the horizon, such as laser projection. 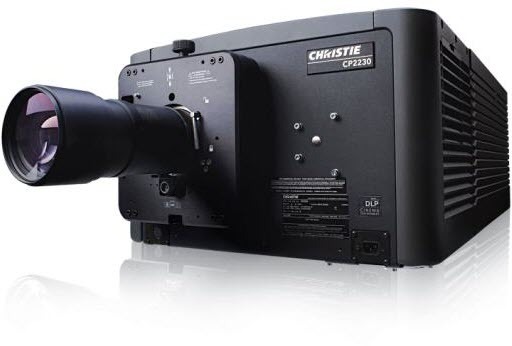 Christie is committed to leading the development and support for this exciting new cinema technology, and proved so when it was the first manufacturer to screen a full feature film with a laser projector at IBC 2012 in Amsterdam recently. That demonstration addressed one of the cinema industry’s most pressing problems – the unsatisfactory showing of 3D content at low light levels, typically less than 3 foot lamberts (ft-L), in contrast to the 14 ft-L that is standard for 2D films. At IBC 2012, , Christie demonstrated just how truly spectacular a movie maker’s vision can be when shown at the highest light levels, delivering unprecedented light levels for 3D content that matched those of 2D using its laser prototype projector, making the shared experience more immersive.